TORONTO – If you’re on the hunt for a high-rise condo in the GTA – or especially Toronto’s downtown core – chances are you have already come across the term “green roof” while flipping through amenity brochures. Once relegated to the domain of forward-thinking corporate campuses and public institutions, these biologically-lush rooftop gardens are now making a huge splash as a key component of live-and-play urban environments. Thanks in large part to their environmental benefits, in 2010 the City of Toronto actually mandated their inclusion in new developments greater than 20 metres (or six storeys) high. The requirement applies whether the building in question is residential, commercial, or industrial. 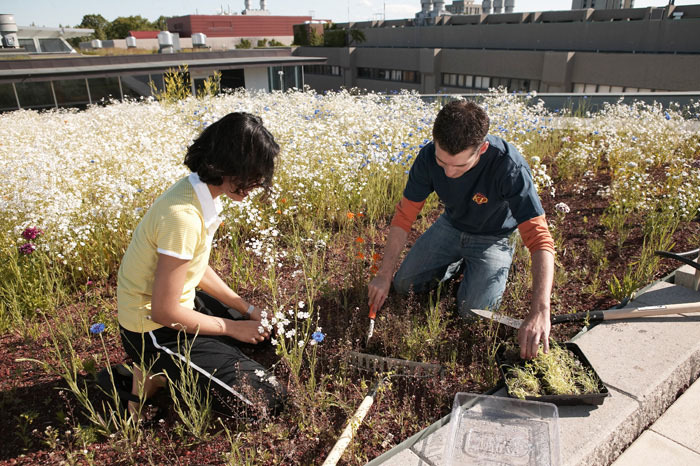 Biodiversity: since one of the key objectives of a green roof is to replace natural vegetation lost due to development, a proper green roof must contain a “non-monoculture” floral ecosystem containing plants that are native to the Southern Ontario climate (and appropriate for its climate – a key factor given their elevation and exposure to the elements). Size: For buildings requiring one, the green roof must cover a set percentage of the available roof space. The mandatory percentage varies on a scale, and is determined by the “Gross Floor Area” – an objective indicator of building size. For condo buyers, a spacious rooftop terrace and tranquil outdoor common areas are often major entries on the “must-have” list. If the high-rise building you’re looking at is new, it is very likely to have a green roof component somewhere in its design. 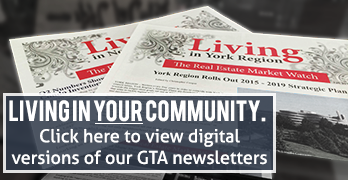 The good news is that these areas are often accessible to building residents! When you’re taking the first walk-around tour of a potential new community, one important thing to look for is whether the green roof is intensive or extensive. Intensive roofs tend have a shallower growing area (less than four inches deep) and are unirrigated. They are lightweight and generally require no structural engineering, but generally cannot support a wide range of plant species. Extensive green roofs feature heavyweight, structurally-engineered planting areas with at least four inches of depth. Added depth allows for a wider range of species, and even the incorporation of habitats for small birds, butterflies and other desirable fauna. Extensive green roofs are a bigger initial investment for the building developers, but moving into a building with one might give you a long-term break on your condo fees, as deep “substrates” (i.e. soil depths) will help to give the plants a better shot at surviving Ontario’s long winters. In recent years, green roofs have begun appearing not just in high-rise buildings, but in low-rise communities as well. In addition to the obvious air quality and environmental benefits of having some green space atop your home, a well-built green roof can also provide remarkable levels of rainwater retention – easing the stress on your municipal drainage systems. According to Scotiabank’s helpful EcoLiving publication, a low-rise green roof can absorb up to 75 per cent of the rainwater it receives. What kind of slope are you dealing with? Green roofs typically require either a flat roof or a very moderate slope in order to grow properly. Are you looking to go intensive or extensive? The former will likely require a significant up-front investment, and quite possibly some structural work on the top of your home. Extensive gardens, on the other hand, can be installed on a suitable roof using root-repellant, waterproof membranes (at a cost of roughly $108 to $258 per square foot). Zoning and development restrictions may be another obstacle – remember that a green roof has its own drainage implications and is also a significant change to the exterior of your home. Contact your municipality’s information desk or phone line to inquire about whether you will be required to undergo a proposal process. Most contemporary homeowners place a strong focus on better air quality and preserving the natural environment – and that’s a priority that will become more significant as the City of Toronto continues to grow, both outward and upward. Watch for significant environmental projects like green roofs to become increasingly prevalent in the coming years – we will certainly be keeping an eye out ourselves!